Darigaaz's Caldera is a Lair in addition to its land type. 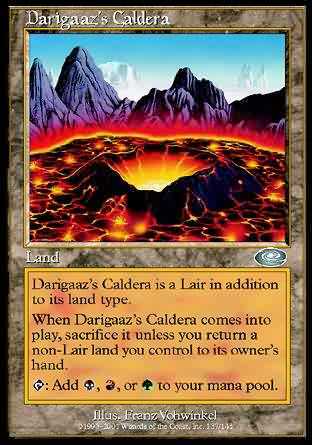 When Darigaaz's Caldera comes into play, sacrifice it unless you return a non-Lair land you control to its owner's hand. T: Add B, R, or G to your mana pool. T Add B, R, or G to your mana pool.